Campbell live interview Bob Burnett about New Zealands first 10 star home. 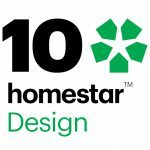 Homestar helps create energy efficient houses. Better to live in, better value in the market, and better for the environment. Bob Burnett and the team are at the heart of the new movement to improve New Zealand housing construction to ensure the advances in modern homes around the world are included here. Most NZ houses build to code are only 3 or 4 star energy performers, but for often no more you can have a house which can operate with a quarter the energy consumption of other houses and for up to 10-20 per cent more in construction cost you can be energy self-sufficient AND earthquake resistant. The New Zealand general approach is building houses that are simply better replications of houses from 50 years ago, ignoring the vast improvements which are commonplace or required in parts of Europe, the Nordic countries and North America. Bob Burnett Architecture says we all deserve better and we start with each house we build now.